Modern data center environments are becoming increasingly complex and difficult to manage. Traditional enterprise data centers are now being combined with or replaced by colocation facilities and private/public clouds. Today’s data center managers need to modernize their facilities and operations to address the challenges of managing these complex hybrid environments, or risk losing their relevance in this new world. How can data center professionals adapt so they will thrive, not just survive, in a world where cloud is king? What tools do they need to accurately manage physical infrastructure, IT service management, and virtual assets? And how can Data Center Infrastructure Management (DCIM) help? 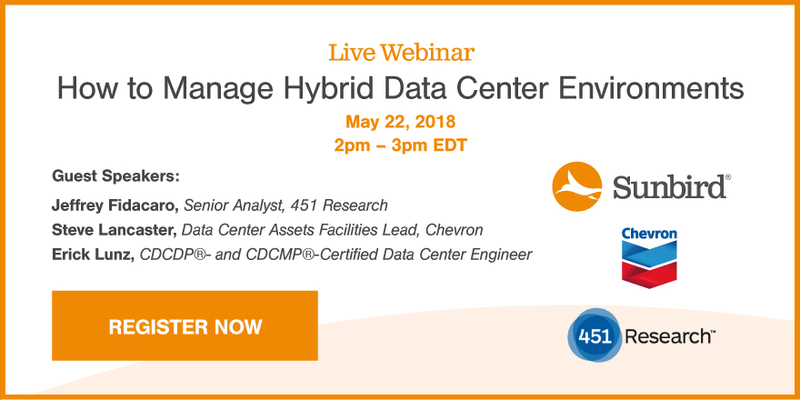 Join us for our next live data center management webinar, How to Manage Hybrid Data Center Environments, on Tuesday, May 22 at 2 PM EDT to explore what data center professionals can do to successfully navigate the complexities of operating hybrid data center environments. Register now to secure your spot. Whether your data center capacity is owner-operated, moving to a colo, or you are adopting a hybrid strategy for data center management, you won’t want to miss this webinar. You’ll gain the real-world, practical advice you need to manage your data center environments now and in the future. Register now to secure your spot. Steve Lancaster, Data Center Assets Facilities Lead, Chevron. Steve has more than 18 years of experience managing data centers and providing IT support. He was responsible for developing Chevron’s San Antonio data center from the ground floor into an enterprise level, highly redundant modern data center. He will share his knowledge gained and lessons learned from using DCIM software with intelligent rack PDUs to successfully optimize Chevron’s 1800+ rack data center environment. Steve will also discuss his plans for utilizing the DCIM software to retrofit an aged data center that uses non-intelligent PDUs to gather data for actual power utilization. Jeffrey Fidacaro, Senior Analyst, Datacenters & Critical Infrastructure, 451 Research. Jeff has over 18 years of technology research experience, with a focus on datacenter technologies and DCIM. Jeff will share 451 research around what’s driving organizations to migrate workloads to the cloud, the challenges presented by hybrid datacenter environments, and recommendations for simplifying the management of these environments. James Cerwinski, Director of Product Management, Sunbird Software. James has more than 20 years of experience in designing, developing, and deploying management systems to improve uptime and efficiency of data centers, telecom central offices, and other IT infrastructure. At Sunbird, he works closely with our customers and engineers to develop our product roadmap. He will demonstrate how Sunbird Software can be used to manage hybrid data center environments. Don’t miss your chance to learn from industry analysts and data center experts who are living through this transition and have the knowledge you need to thrive in this new world. Register today. Can’t attend the webinar? Register anyway, and we’ll make sure you get access to the recording. Registration Link: Sign up here!